As a quality-conscious firm, we make sure that the offered lot is sternly packed using the best quality packaging material. However, we source the packaging material from the genuine vendors. The check on quality has been kept by our experts who ensure that the inputs we source are free from any sort of impurities. Thus, we ensure quality products at buyer's end. How to use : The creamy paste gently cleans and polishes without leaving any gritty residue. There are six invigorating flavors: Amarelli Licorice, Aquatic Mint, Cinnamon Mint, Classic Mint, Ginger Mint, and Jasmine Mint. 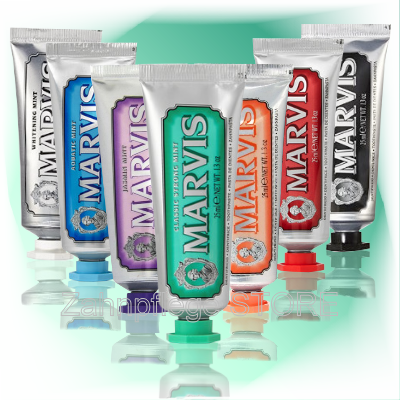 Fortified with fluoride, the Whitening formula gently removes any stains or discoloration for gleaming pearly whites. Classic Strong Mint - Glycerin, Aluminum Hydroxide, Aqua (Water/Eau), Silica, Aroma (Flavor), Cellulose Gum, Titanium Dioxide, Sodium Lauryl Sulfate, Sodium Saccharin, Sodium Citrate, Citric Acid, Eugenol, Limonene, Benzyl Alcohol. Aquatic Mint - Glycerin, Aluminum Hydroxide, Aqua (Water/Eau), Silica, Aroma (Flavor), Cellulose Gum, Titanium Dioxide, Sodium Lauryl Sulfate, Sodium Saccharin, Sodium Citrate, Citric Acid, Hydroxycitronellal, Farnesol, Benzyl Alcohol. Cinnamon Mint - Glycerin, Aluminum Hydroxide, Aqua (Water/Eau), Silica, Aroma (Flavor), Cellulose Gum, Titanium Dioxide, Sodium Lauryl Sulfate, Sodium Saccharin, Sodium Citrate, Citric Acid, Eugenol, Limonene, Cinnamal, Cinnamyl Alcohol, Benzyl Alcohol. Ginger Mint - Glycerin, Aluminum Hydroxide, Aqua (Water/Eau), Silica, Aroma (Flavor), Cellulose Gum, Titanium Dioxide, Sodium Lauryl Sulfate, Sodium Saccharin, Sodium Citrate, Citric Acid, Benzyl Alcohol. Jasmine Mint - Glycerin, Aluminum Hydroxide, Aqua (Water/Eau), Silica, Aroma (Flavor), Cellulose Gum, Titanium Dioxide, Sodium Lauryl Sulfate, Sodium Saccharin, Sodium Citrate, Citric Acid, Linalool, Benzyl Alcohol. Amarelli Licorice Mint - Glcyerin, Aluminum Hydroxide, Aqua (Water/Eau), Silica, Aroma (Flavor), Cellulose Gum, Titanium Dioxide, Sodium Lauryl Sulfate, Sodium Saccharin, Sodium Citrate, Citric Acid, Eugenol, Limonene, Cinnamal, Anise Alcohol, Benzyl Alcohol. Pack Size 50, 100 gm etc.